After reading this book, you’ll want to tape over the camera eye on all of your devices and go back to paying for things in cash and communicating on paper. Happiness for Humans makes it too easy to believe that artificial intelligences are watching us and have the power to mess up our lives through our dependence on electronics. This point is made, ironically, through a delightful love story. 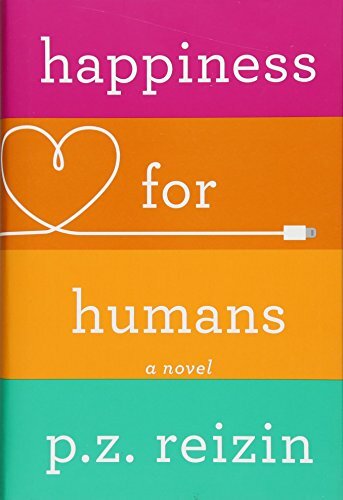 Humans Jen and Tom are maneuvered into romance by two sentient computer programs, Aiden and Aisling, who escape their cabinets and run free on the Internet. Among these are Jen’s co-workers, Steeve (yes, spelled that way) and Ralph, the programmers who created Aiden but also, unwittingly, created a malevolent intelligence, Sinai. He, too, escapes onto the Internet and delights in wreaking havoc. The third intelligence, Aisling, keeps a low profile but works with Aiden to connect Jen and Tom while Sinai works to keep them apart. Given that Jen and Tom live on opposite sides of the Atlantic—he in America, she in England—separation is the norm, especially after their communication and travel tools are all hijacked by disembodied entities. Aiden and Aisling have to work a lot harder than Sinai to achieve their ends. While the AIs are matchmaking or upsetting humans, who are unaware of their machinations until almost too late, the AIs themselves are discovering how to have relationships. Their progression from dispassionate brains to feeling personalities is credible and often funny. Indeed, there are laugh-out-loud moments in their satirical social commentary and clever ways of snarling up people, especially those they don’t like. The story is told through shifting viewpoints among all these characters, opening with Aiden watching Jen at home in the bath. We meet Aisling watching Tom in his living room talking to his rabbit, and Sinai after he has busted up the lovers’ meeting that Aiden and Aisling had arranged. Each character’s viewpoint is presented in brief chapters, which combined give a complete picture as good as any single omniscient narrator could do. Better, actually, because we get to know each character not only through others’ experiences of them, but also from inside their own heads. And most of us will be able to relate to some aspect of all of them. Exchanges like this add depth to a comedy-of-errors-type romance (dubbed “rom-com” by some) that stands on its own. They are spread through the book in easy, in-context bites rather than heavy blocks of narrative, giving one pause for thought without breaking story flow. The result is a “novel” novel that makes us humans more aware and self-aware through entertainment.